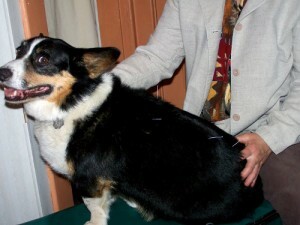 Dog receiving acupuncture treatment from Dr. Schilling. Certified by the American Animal Chiropractic Commission of the American Veterinary Chiropractic Association since 1997. Veterinary Spinal Manipulation (VSM, aka “animal chiropractic” in states other than Wisconsin), Veterinary Acupuncture and Qigong Energy Balancing are examples of a group of unconventional therapies that are referred to as Complementary/Alternative Veterinary Medicine or CAVM. All of the healing methods I use are forms of energy work, influencing the nervous system and the energy systems of the body, each in its own way. Combining them enhances overall effectiveness of therapy. These modalities can be used as primary therapy or as a supplement to conventional veterinary medicine. Offer healing services that are truly alternatives to conventional veterinary medicine when conventional medicine is not as effective as might be desired. Provide care that complements and enhances mainstream medicine. Offer better outcomes and improved quality of life for my patients. Timely scheduling of treatments allows each treatment to build on the results of the one before with out starting over each time. Hour long appointments and a home like atmosphere allow animals to relax making Veterinary Spinal Manipulation easier, more effective and longer lasting. It also improves the patient’s attitude about coming for a visit!